Our Alaskan wilderness fishing lodge was established in 1939 and provides simple comfort for up to eight guests in a remote setting. 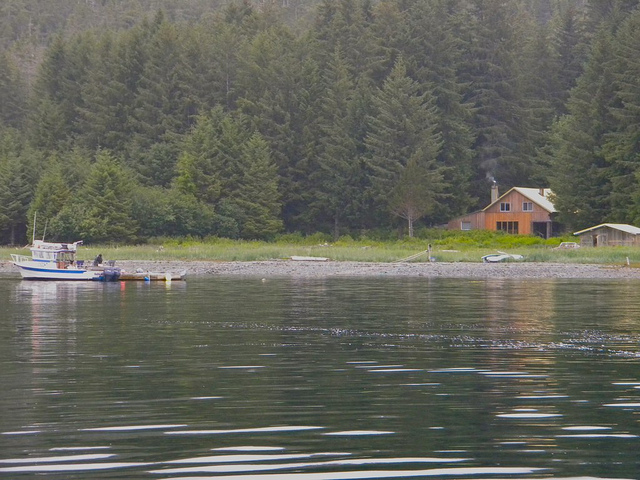 It simply doesn’t get any better for Alaskan fishing than it does with Lisianski Lodge. A fast modern Alaskan fishing vessel 32x12' with 24 knot cruise, heated cabin and walk around bow, has lots of room for six fishermen to catch salmon, halibut, lingcod and rockfish and enjoy the southeast Alaska wilderness. View of Lisianski Inlet and the Fairweather Mountain Range, Pelican, Alaska. The dinning room of the Lisianski Inlet lodge in Pelican, Alaska. The Lisianski Inlet Lodge charter fishing vessel. View of lodge from the water. No matter if you’re a vacationing family and you want to teach your little ones, or it’s your dream to wrestle with a huge Lingcod with your co-workers, Lisianski Lodge is the ultimate choice for any type of fishing game you're looking for, including fly fishing! We welcome both newbies and old pros with open arms. Blueberry, huckleberry, strawberry, raspberry patches, and more! Built in 1939, Lisianski Lodge rests within the Tongass National Forest, the most northern rainforest in the world. We are secluded and calming, yet also adventurous and thrilling. You can take a soothing bath at the White Sulphur Hot Springs and enjoy views of humpback whales and nearby Glacier Bay National Park. We take pride in everything that we do. With stunning surroundings, committed service, and a homey, rustic environment, Lisianski Lodge is the perfect fisherman’s paradise.